Pulse flour, salt, and sugar in a food processor (or whisk together by hand in a bowl). Add butter and pulse until mixture resembles coarse meal, with some larger pieces remaining. Drizzle 2 tablespoons water over mixture. Pulse (or mix with a fork) until mixture just begins to hold together. If dough is too dry, add 2 tablespoons more water, 1 tablespoon at a time, and pulse (or mix with a fork). Gather dough into a ball, wrap loosely in plastic wrap, and press each into a disk using a rolling pin. Refrigerate until firm, well wrapped in plastic, 1 hour or up to 1 day. Preheat oven to 180 C. On a lightly floured piece of grease proof paper, roll out dough into an approximate 20cm oval, around 1/2 cm thick. Transfer dough (on paper) to a baking sheet or tray. Pulse almonds, 3 tablespoons sugar, and the flour in a food processor until ground to a coarse meal. Sprinkle almond mixture over dough. With a spatula, transfer plum slices to dough, spacing close together and leaving a 5cm border; press lightly to fan out. Fold edge of dough over fruit. Refrigerate 30 minutes. Brush dough with cream; sprinkle galette evenly with remaining 1 tablespoon of sugar. 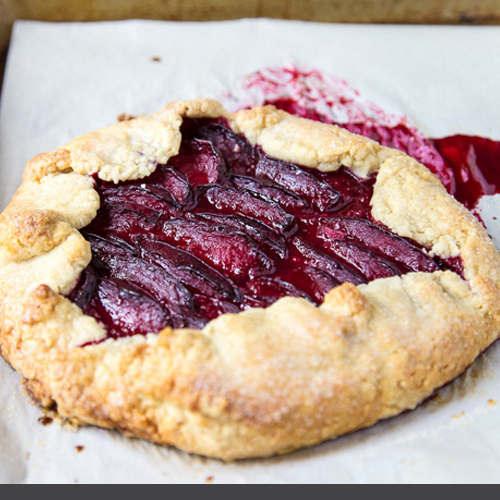 Bake until crust is deep golden, and plums are juicy and bubbling, about 40 minutes. Transfer to a wire rack, and let cool completely.